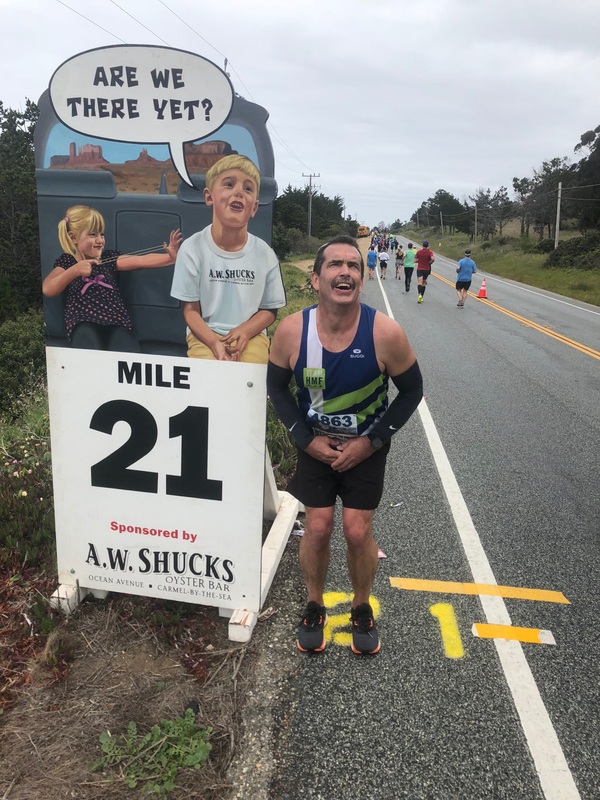 This is my 4th Big Sur Marathon with a total of 53 marathons completed. I was able to get a guaranteed entry through the Runners World VIP program. It’s a bit expensive but worth not having to worry about not getting into the lottery. Saturday before the race, Michael Wardian who has won the Big Sur Marathon multiple times hosted a shakeout run at the local Fleet Feet store. We ran a bit with him and even jumped into his group photo during the run. There was a post waffle breakfast and raffle prizes for swag. It was great to chat with him. What a down to earth guy. I love to explore running in different locations. It’s such a nice way to see different sections of Monterey that you wouldn’t get to see while driving in a car. Bib pick up at the Expo was seamless. We received our bib, race shirt, bus ticket and instructions for the bus pick up and a black VIP backpack that is used for the gear check bag. It’s nice because I was able to pack a lot of extra stuff and have it waiting for me at the VIP tent. I loved the Runner's World VIP Facebook page too as a resource to go to for any last minute answers for logistics. The morning of the race I had concerns about parking and finding our bus as our group have 3 different bus locations with the different races (VIP, B2B, 21 miler). I have to say there were no issues and the volunteers on each corners of each street were so helpful. Another perk for the VIP program are the nice coach bus with bathrooms and reclining seats. I was able to doze off for the hour drive to the race start. In the past I’ve taken the school buses to the start and had felt a bunch of anxiety as we drove on what seemed to be very narrow bridges and winding roads. Its dark too as we have to be on our buses at 4:15 am. We got to the nice heated tents where runners world staff was extremely informative with instructions. In the past (before VIP) I was out in the public open area where we had fought to stay warm with clothes from the local Goodwill store to stay warm. When it was time to head out to the start line, the VIP runners were directed out of the fenced area uphill which means we start running downhill. 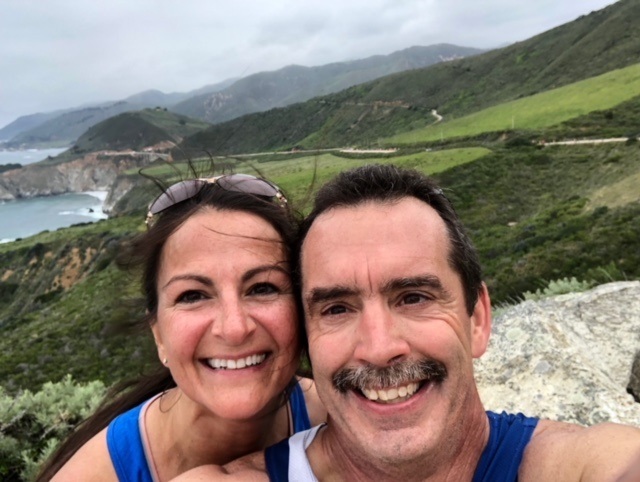 For those runners that have never run Big Sur it’s a nice gentle way to introduce them to the course that doesn’t seem that bad for the first 6 miles. We start in the Pfeiffer Big Sur State park in redwood tree area where we have a few bands and local people cheering for us. I cracked up when someone running yelled “get a good look at the crowd support since that’s all you’ll see until you finish”. We keep running until finally we get our first glimpse of the ocean start to peek through. This area is what I call the “cow” area. The cows come close to the fence when you run by. On the left hand side is the first sighting of the lighthouse that is located on what appears to be a large island made of rock that seems so far away at first. We continue running until the Lighthouse is so close. We can make out the small beach in front of the rock area; stunning and surreal. Around mile 9 the first of the hills begin. I recall my dear friend looking at me after the first 2 1/2 miles of climb uphill “Jeanne, please tell me that was the last of the hills”?! I said that there were a few more bumps in the course. Then, more hills followed by more as we started the climb to Hurricane point. This section is difficult, beautiful, and with each corner and turn, just when you thought you hit the top, you turn another corner and there is yet another hill to climb. Then the winds picks up the closer you get to the top. We arrived on the top of Hurricane point and I remember looking up as runner’s hats started flying off and the sounds of all the bib’s rippling with wind like they were going to be ripped off. It’s incredible as you look out as far in the distance ahead and see and the runners on the long windy hills as far as you can imagine. I love turning around and looking at how far we’ve just come. Runners in both direction moving with strength the determination. The halfway point the wind seems to disappear as we make our way to Bixby Bridge. The sound of piano playing can be heard in the distance. Finally we get a break from the hills and we start our decent down to the bridge. 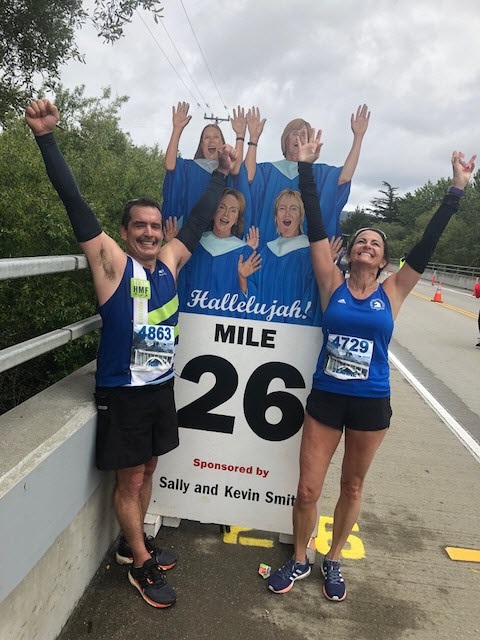 This is one of my favorite parts of the race seeing the grand piano and the bridge as the backdrop for the most spectacular photos! We get some other treats to help distract us from the difficult course: local schools marching bands, Taiko drummers and let’s not forget the Fire Dancers sporting their colorful outfits. Each mile marker has some of the funniest signs and sayings. They seem to be selected carefully by seasoned runners knowing what the stages runners go through as the miles start to build. A few that stand out to me are the Miler Marker 14 “Anyone need a lift” with a photo of Col. Greg Mislick USMC grabbing your hand from a helicopter ladder, Miler Marker 16 our friend Buddy saying “Hey did I ever tell you my Big Sur PR story?”, and the woman saying “Uh, Yeah Only about a Million times!, Miler Marker 20 “with the man climbing the wall” and who can forget mile marker 25 with the Gospel singers lifting their arms “Can I get an Amen?”. We made a point of posing silly for each of them. It made us look forward to the next mile marker and as result, those miles began to fly by. 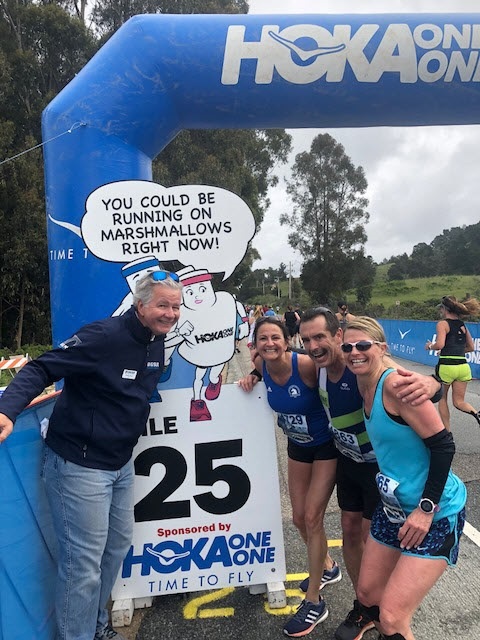 We even saw our friend Buddy (who is also on the Board of Directors for the race) at mile marker 25 that ran us in about ¼ mile to get a photo opp. I can’t say enough about the people that work for Big Sur. We met Buddy the first year and he still remembers us year after year. Only a couple more hills and then we’ll be done. We arrived at the Strawberry table so I knew the finish was close. Let me tell you those strawberries have to be the best I’ve eaten IN MY LIFE! Towards the end, the canter of the roads made it difficult to figure out which side of the road to run on. My right ankle was screaming at me to stop but I kept going. 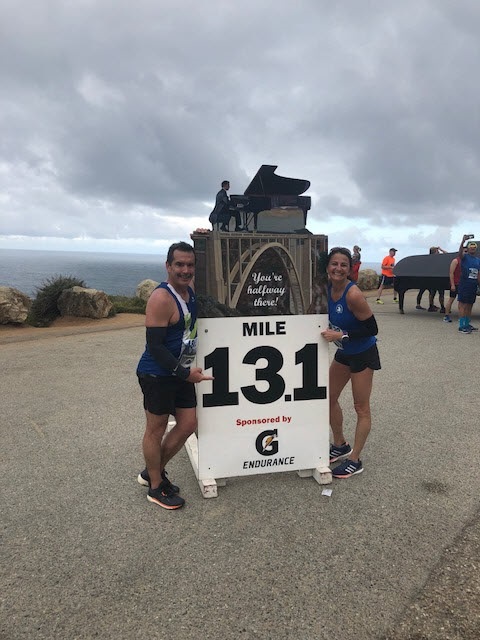 I ran with my best friend/fiancé Kim and my other friend Rosanne who was running her first Big Sur. I sort of persuaded her to sign up for the lottery (it really wasn’t that hard). She certainly is a much stronger person because of this race. We made a point of sticking together through thick and thin, through cursing and laughter, until we saw that finish line and kicked up our pace. We grabbed each other’s hands and screamed as we crossed that finish line. AMAZING. I grabbed Rosanne as I was so proud of. We hugged and cried. 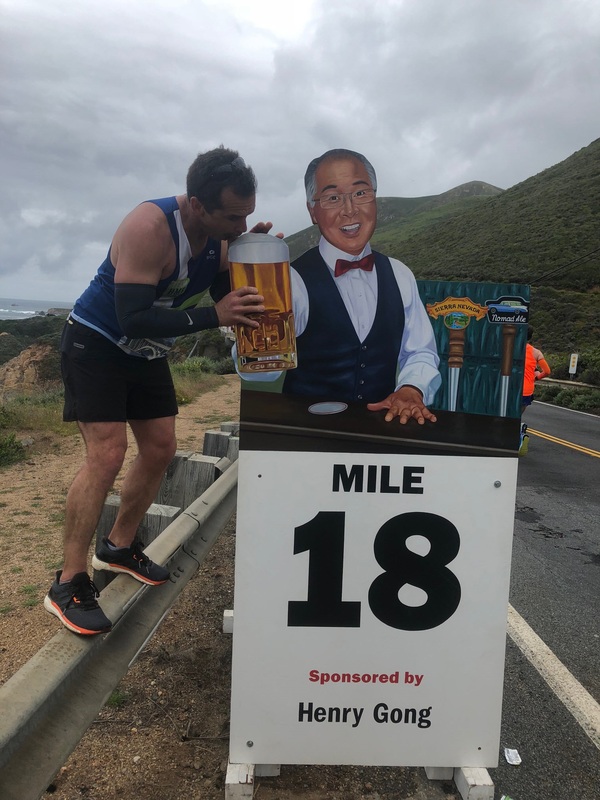 I don’t care if this was my 1st or 4th time running Big Sur. It’s an accomplishment every time that makes you dig deep to brings out the determination and drive inside that you don’t even know where it came from. I hope I get the chance to run it again! Maybe next year??? ?